Ramapo, N.Y. – Diana Carey’s contributions to Rockland Community College extend well beyond her care for the college’s student-athletes. 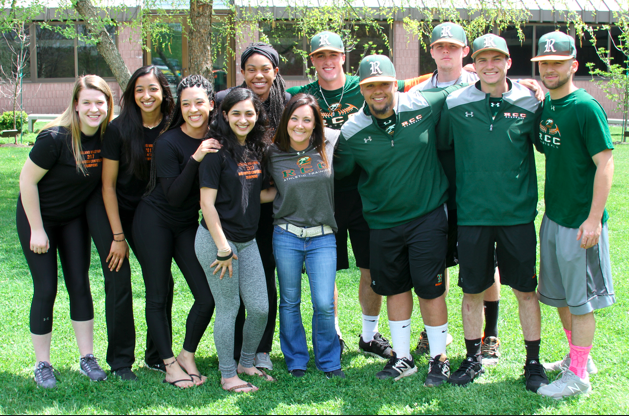 As head athletic trainer for RCC, she tends to the treatment and rehabilitation needs of those student-athletes and provides coverage for all nine of the college’s athletic teams’ Region XV events on campus. But on any given day during the school year, she can also be found mentoring student volunteer interns in athletic training, teaching courses as an associate professor in Exercise & Human Performance, or carrying out fitness and wellness programs for students, athletes, faculty and staff. So it comes as no surprise that Carey’s work has been recognized by various organizations during her 18-year tenure at RCC. The most recent, and perhaps most prestigious acclaim to come her way is the 2018 Head Athletic Trainer of the Year in the Community College/National Junior College Athletic Association division, conferred by the National Athletic Trainers’ Association (NATA) Intercollegiate Council for Sports Medicine (ICSM). She will be honored at the ICSM’s awards breakfast on June 28 at the 69thNATA Clinical Symposia and AT Expo in New Orleans, Louisiana. The ICSM awards recognize collegiate athletic trainers who have demonstrated exceptional performance in their setting. The categories include Head Athletic Trainer of the Year in NCAA Divisions I, II and III, NAIA, Junior College/Community College and Club/Intramural/Recreational Sports. As a faculty member and discipline coordinator in Exercise & Human Performance (formerly Physical Education), Carey instituted separate academic tracks in athletic training, exercise science and recreation and leisure as part of the Associate in Science (AS) degree program in Human Performance Studies. A 1997 RCC graduate, she started in the department in 2000 as an adjunct and as fitness coordinator, fresh out of Manhattan College, where she earned a BS in Exercise Science/Sports Medicine. Since 2006 she has taught physical education, fitness and athletic training courses at RCC. She went on to obtain a master’s degree in Nutrition from Lehman College, CUNY, in 2008. A committed contributor to the college and general community, Carey has made presentations on nutrition and weight management, organized the Rockland Colleges Care cancer fundraising event, and chaired or held membership in a range of academic committees on campus. Carey earned the SUNY Chancellor’s Award for Excellence in Faculty Service in 2015 and merited a “Forty Under 40” award from the Rockland Economic Development Corp. in 2008, among other distinctions. She resides in Rockland County with her husband, Pat, and two children, AJ and Nicole. Diana’s husband Pat, like Diana a North Rockland High School and RCC alumnus, earned induction into the RCC Sports Hall of Fame in January for his baseball prowess as a player and coach for the Hawks. He also served as head baseball coach for Iona College for 13 years.